To my faithful readers - as you all well know, I am very passionate about flying and aviation. What I haven't discussed in these pages until now is that I have also been an avid photographer for pretty much my entire life. For about six years I did weddings and had a lot of fun doing them. I've also done a fair amount of studio portrait work. That was way back when in the days of film photography. In recent years I have been mostly in a small niche market shooting construction and remodeling timelines; i.e., start-to-finish photos of projects so that the client has a visual record of the progress and completion of the project. After some serious ruminating about my direction in photography and consideration of my options, I have decided to take the leap into photography as a full-time gig. I have been hired via Thumbtack several times now and I think it is a great marketing tactic. I recommend it to all photographers who are just getting started in the business. Wish me luck with Straka Photography, and please refer me whenever possible. I stare awestruck at the sight of Columbia streaking and tumbling and crumbling like a meteor across an indigo background, its pieces flashing and sparkling like so many diamonds in the sky. My mind’s eye replays other such scenes, scenes of people with the right stuff carrying the hopes and dreams of humanity to a sad but temporary end - Apollo 1, Soyuz 1, Soyuz 11, Challenger. Challenger and Columbia, star-crossed vessels holding the family of man in their wombs, their spectacular yet starkly shortened paths across the heavens will forever be etched in our collective memory. I drift back in time and see a little boy sitting for hours and days in a nearly-empty library devouring every book about space adventures, travel and exploration in distant exotic worlds, every book written by Asimov, Bradbury, Heinlein, Clarke and others, and I think - no, I know - there were other little ones just like him, in other libraries in other towns, others who made it. Others who had the dream and vision and were able to make it come true and I, having taken a different path, I envy them. Oh how I do so envy them. Even now in the face of another reminder that no matter how hard we try, if we don’t get it right, nature cannot and will not be fooled. As always when things go wrong, there are those who say we should leave space alone, we shouldn’t go there, it’s too dangerous, we don’t belong there, we need to fix problems here first. They who just don’t understand – correct to a point, they don't or can't see the greater vision. Trite as it sounds, space truly is the last frontier left for man to explore. We must do it - we are meant to go there. We are on the verge of a greater diaspora than humanity has ever seen. Yes of course space exploration is risky and fraught with danger. Yes of course there have been close calls and people have died, and most likely they won’t be the last. It is the nature of exploring a hostile environment while depending upon less-than-foolproof machines and technology. Those who have the chance to go, they know and understand this. But you know what? It is a certainty that each and every one of our intrepid spacefarers would not have it any other way. Each and every one of them died while living their dream, as I would if I were able. It would be a grave dishonor to those lost if we were to give up now. It is our responsibility to find out what went wrong, to fix it, and to continue the quest. We MUST continue, for the stars beckon us. As surely as the unknown seas beckoned to Columbus and Magellan, the stars call to us. Like the sirens to Ulysses the stars cry out to us and, like it or not, however long it may take we cannot resist them. It is our nature, it is our instinct - we are compelled to explore, to discover new places to live and work and survive, and to take all of humankind along if only in our own dreams or thoughts. We must continue the quest, for it is our destiny. Besides being a website and internet professional, one of the other things I do to pay the bills — and to support my flying jones — is I shoot photos and video. A few weeks ago, er, ok well some months ago, I helped out filming and shooting stills of cancer patients and their families for the benefit of an incredible support organization in the Denver area, Cops Fighting Cancer. It is hard to overstate how intense and emotional an experience it was for all present, including us on the film crew. I found it just incredible that the patients and families had the courage to sit in front of the camera and answer questions about their experiences. At times there was hardly a dry eye in the room. I was totally impressed and amazed at both the sensitivity of the interviewer as well as the heartfelt, articulate, and at times very difficult and emotional responses by the patients and family members. Unless you have experienced a loved one suffering through cancer you simply cannot imagine all the ways it affects your life. I had a personally poignant perspective because my mom died of cancer at the age of 47 when I was 23. At that time there were no such things as support groups, or even family therapy beyond whatever your religious congregation or friends provided. Which, sad to say, was minimal at best. But then again, nobody knew any better back then. It is very heartwarming that groups such as CFC now exist to aid and assist cancer patients and their families through the incredible difficulties that they face. CFC in particular is doing some awesome things such as their recent Casino Night and Toy Drive. Check out their activities at Cops Fighting Cancer. 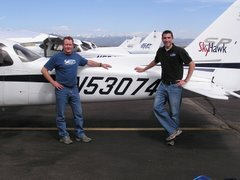 Private Pilot since JAN2007, Ground Instrument Instructor in DEC2009 with about 180 hours total time now on the way to instrument rating and training to become a flight instructor. Pilot or not, you have got to see this!